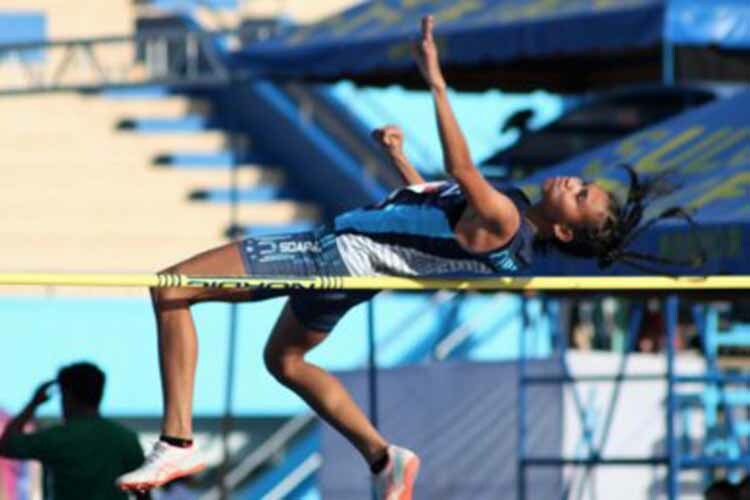 ILAGAN CITY, Isabela — Raziebel Fabellon gave Adamson University its first gold medal in the Ayala Philippine Athletics Championships after winning the women’s high jump event on Thursday at the Ilagan Sports Complex here. The 19-year-old athlete from the town of Naujan in Oriental Mindoro registered 1.65 meters to beat Nueva Vizcaya’s Josefa Ligmayo, who settled for the silver medal with 1.60 meters. University of Baguio’s Roma Faye Basco registered 1.40 meters to take the bronze medal. “Hindi ko akalain na tatalunin ko s’ya [I did not expect to beat her],” said Fabellon after beating Ligmayo of Far Eastern University in the tournament organized by the Philippine Amateur Track and Field Association (PATAFA). Ligmayo, who studies at Far Eastern University, holds the University Athletics Association of the Philippines (UAAP) high jump record of 1.71 meters she set last February at the Philsports Complex in Pasig City. The 5-foot-7 Fabellon debuted in the UAAP in 2016, finishing seventh in high jump and eighth in triple jump. Last year, she improved to fifth place in high jump. “Natutuwa ako dahil first time ko sumali dito at nanalo ako [I am happy because this is my first time in the tournament and I won],” said Fabellon, who posted a personal best of 1.60 meters in one of the PATAFA weekly relays last year. “Para sa pamilya ko ang gintong medalya ko,” said Fabellon, who is the youngest among seven children of Ronald, a businessman, and Daisy, a plain housewife. Fabellon hopes to follow the footsteps of eminent long jumper Elma Muros, the last Filipino to win a medal in the 1994 Hiroshima Asian Games. “Magaling siya,” said Fabellon, when asked why she admires Muros, a multi-medalist in the Southeast Asian Games and a contemporary of Lydia de Vega, who is known as Asia’s sprint queen. “Sana maging member din ako ng national team [I hope to become a member of the national team],” said Fabellon, who was introduced to athletics when she was in Grade 4 at the Masaging National High School in Naujan town. Fabellon also acknowledged the contribution of Adamson University’s athletics team head coach Ronald Corot and assistant Aquihiro Parrenas to her victory. “Malaki po ang naitulong nila sa magandang performance ko,” said Fabellon, a cousin of national team mainstay Mervin Guarte, who won the bronze medal in the 1,500 meters event during the 2017 SEA Games in Kuala Lumpur, Malaysia. Meanwhile, Philippine Army bets Macrose Dichoso and Richard Salano ruled their respective events in the tournament supported by MILO, LTime Studio, Soleus, Cocolife, UCPB Gen, Foton, Cherrylume, PSC, IAAF, Rebisco and F2 Logistics. Dichoso clocked 39:41.00 to win the gold in the women’s 10,000 meters event while her teammate, Jho-An Villarma, got the silver in 40:30.87. Lany Adaoag of Team Titus placed third in 42:13.86. Salano topped the men’s 3,000 meters steeplechase event in 9:23.21. Christopher Ulboc of Philippine Air Force was second (9:39.43) followed by Jomas Angus of De La Salle University (9:57.91). The other opening-day gold winners were Eduard Josh Buenavista of University of Baguio and John Albert Mantua, representing RP Team-City of Ilagan. Edward Josh, son of two-time Olympian Edward Buenavista, bagged the boys 3,000 meters steeplechase gold medal with a time of 9:52.07. Run Rio – UP Team’s Germar Marcelo (9:52.93) and Nathaniel Morales (9:57.44) pocketed the silver and bronze medals, respectively.